All disbursements are automatically captured by LEAP, so not only will you never miss out on recouping these disbursement fees, you also save time by eliminating unnecessary data entry. How does InfoTrack work with LEAP? Integrated searching available between LEAP and InfoTrack allows you to order your searches directly from the Electronic Matter in LEAP without having to re-key any data. The results are then returned into the document management system and automatically debited to the matter ledger. True integration gives you immediate access to all your conveyancing tasks meaning you only need a single window and a single login. Most searches ordered from within LEAP helps you save time, with search fields auto-populated and search results returned directly back to each matter. 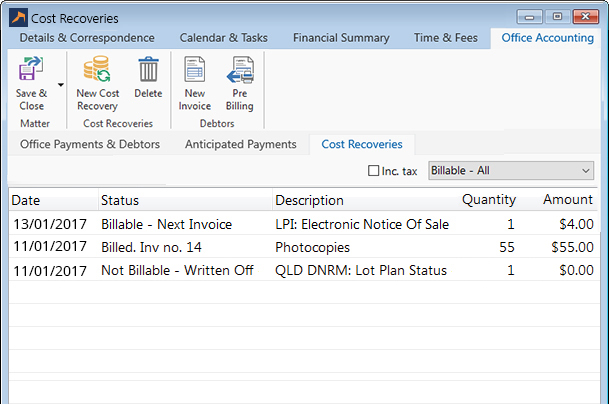 All disbursements are automatically returned to LEAP, removing any manual processes of entering cost recoveries. All relevant documents ordered through InfoTrack are quickly merged into LEAP and are stored for 7 years.